Get your child (1 year old to 13+) a free two-year subscription to LEGO Magazine! Home delivery of a LEGO® Club Magazine, full of LEGO news, comic adventures, games and puzzles, building challenges and Cool Creations built by LEGO fans! 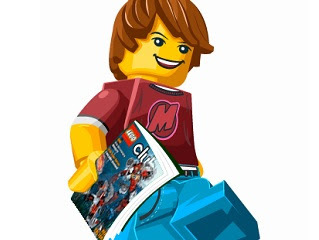 Children under 7 years old can receive the Lego Jr. magazine. US, Canada, Germany, England, Ireland, Austria, Switzerland, The Netherlands, Norway, Sweden, Denmark, Finland, France and Poland. For residents of Australia and New Zealand, please click here. Your first LEGO Club Magazine will be delivered in 4-6 weeks (US and Canada) / 6-18 weeks (Europe). It's a great idea to note the date you request a freebie. Most samples arrive 6-8 weeks after you've asked for them, unless it says otherwise on the confirmation page. ◊ Check us out on Twitter, and join in the conversation of even more great freebies, deals and coupons on our Frugal Freebies fan page on Facebook and Google+. We are even on Pinterest! ◊ Born to Love: All your cloth diapering needs, and much more - naturally! We are strong advocates of the personal, social and environmental benefits of natural parenting. ◊ Frugal Baby Tips: Money-saving tips on diapering, diaper washing, safety, slings and baby carriers, toys, clothing, nursing, menstrual needs, traveling with kids, more! ◊ Jamberry Nails: The hottest trend in nail design. Get high-end nail art without the fuss of polish - or expensive salon visits! Like us on Facebook! ◊ Oshawa Journal: A Step Back in Time to the Village of Oshawa - historical family timelines, news clippings, birth/marriage/death/grave records, photos and stories of the people I am researching, as well as the history of streets and houses in the village of Oshawa.